Your domain name is your business’s online identity, it helps your clients find your business. Just like a physical shop front, you’ll want your online ‘address’ to be memorable and easy to find. One of the questions that often come up is whether a business should register a .com.au or .com domain. The answer varies and depends on the nature of your business. The following questions will help you identify the type of website extension you may need. 1. Where is your business based? If most of your clients are based in Australia and you only want to target people living in the country, a .com.au address will help search engines like Google direct traffic to your site from Australian browsers. This is especially relevant if you have an e-commerce store or services that only caters to Australian residents. Registering a .com.au domain name for your Australian business indicates to Google that you are based in Australia, and this could mean that you show up in more search results when Australian consumers are searching for products or services like yours. 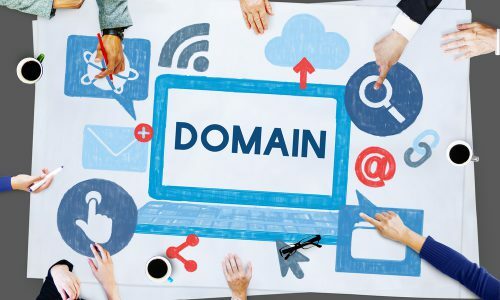 If you have a product or service that’s accessible worldwide, a .com domain may be the better option but if you want visibility when people are searching for local suppliers, a .com.au domain may be better suited. Note: Your domain name won’t be the only driver for relevant traffic but it does add weight to how your site is ranked. If you have a business that mostly cater to customers in your local area, you may also want to consider a .Sydney or .Melbourne domain name. 2. Do you have plans to expand your business on a global scale? With over 115 million domains registered worldwide, .com website domains represent 42% of all web addresses*. If you intend to offer your product or service globally, you’ll need a .com presence as it is the most recognised domain extension. Even if you are unsure about scaling your business, it may be best to register it in case your competitors do. Note: Your domain name isn’t the only driver for relevant traffic. Your website content, user experience and things like page speed will determine how your website is ranked in the search engines. 3. Is your domain name already taken? This might be an obvious question but one that comes up quite often. You may have a domain in mind but find that it’s already been taken. If this is the case, you can contact the owner of the domain name and request to buy it but often this comes with a premium price tag. If you find that your .com and .com.au domain is already taken, a local domain like .Sydney .Melbourne can serve as a suitable alternative domain extension. A good domain name should reinforce your brand name and make it easier for customers to find you. However, it isn’t the only factor that will influence your site’s visibility in search engines. If you want to be found, you’ll need quality content, a site optimized for SEO and a great user experience onsite. Need a domain name? Check to see if your .com or .com.au extension is available.